This poor guy got an earful. Set your cringe muscles on “active” and stick in those earbuds, because we’re about to steer you into a very NSFW 8-minute video journey into the land of Consumers Behaving Badly. Just to remind you all once again, that there’s a whole lot of language in here that is not meant for polite company — including racial slurs toward the very end — so view with caution. 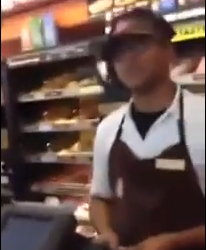 The situation, as best as we can figure out, is that the customer in question rolled through a Dunkin’ Donuts the night previous to filming this video and didn’t get a receipt from the server. During her extended rant (posted on News 11’s YouTube) she goes from being pissed off, to somewhat nice to the cashier, to conversational with the man standing in line behind her (who probably just wants to get his coffee and get outta there), back to extremely ticked off and insulting. Killing’em with kindness is definitely not something at work here. One thing we can’t figure out is whether or not she can’t wait to post this to Facebook.